Jeep has showcased its mid-sized pickup truck that is based on the Wrangler, the Gladiator at the 2018 LA Motor Show. It was earlier speculated, thanks to an online rendering, the Jeep might use the Scrambler name. However, the American automobile brand has re-launched the Gladiator model name that was introduced in 1962. 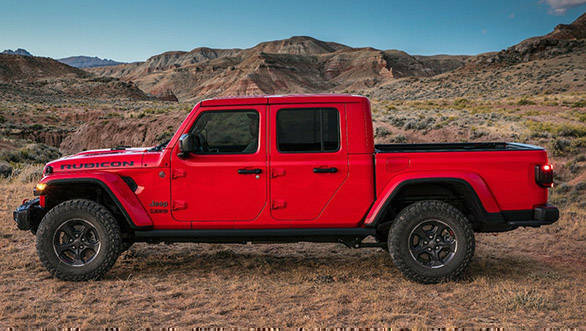 The all-new Jeep Gladiator is being built in Toledo, Ohio. It is the same facility where Jeep vehicles have rolled off the assembly line since 1941 and also where the Jeep Wrangler JK was built until April 2018. Jeep mentions that the manufacturing capacity for the 2019 Gladiator has been created by shifting the production of the next-generation Jeep Wrangler to the north side of the Toledo Assembly Complex as part of a $4.5 billion industrialisation plan to realign the Company's U.S. manufacturing base to expand the Jeep and Ram brands. FCA US has invested $700 million to retool the north plant and added more than 700 new jobs to support production of the new Wrangler. 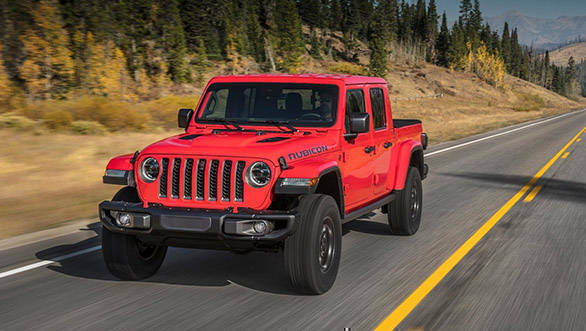 From the looks of it, the 2019 Jeep Gladiator comes with all the typical design cues of a Jeep and that is a good thing. Jeep mentions that the design team has kept the legendary seven-slot grille seen on Wrangler, but widened the grille slots for additional air intake to assist with the increased towing capacity. The top of the keystone-shaped grille is gently swept back to enhance aerodynamics. Both the Gladiator Overland and the Rubicon come with LED lights and fog lamps with LED DRLs. The rear profile gets traditional square tail lights and offer wide tailgate opening for unobstructed loading of cargo into the bed. The tailgate is capable of stopping in three positions, while cargo can be easily stored in a power-locking tailgate. The 2019 Jeep Gladiator also gets an under-rail bed lighting with a covered external power source (400W 115-volt, three-prong) The available Trail Rail Cargo Management System provides additional storage options to organize and secure cargo. An available spray-in bed liner, bed divider and tonneau cover provide even more options to keep cargo secure. The Jeep Gladiator Rubicon models are equipped with protective cab and cargo bed rock rails. A four-bolt design at the top of the windshield's frame allows for the windshield to fold down quickly and easily. A header bar connects the A-pillars and stays in place even when the windshield is folded down. This allows the rearview mirror to remain in place even with the windshield folded. The pick-up trucks gets a two-piece body-color fender flares with a black lower insert give a raised profile and are standard on Overland and available on Rubicon models. Further, Gladiator Overland and Rubicon models share an available three-piece body-color hardtop option, offering a unique, premium appearance, while a black three-piece hardtop, available on all models, offers even more options for open-air driving. The two Freedom panels and quick-release latches enable a fast removal and installation of the hardtop. All hardtops feature a manual rear-sliding window. 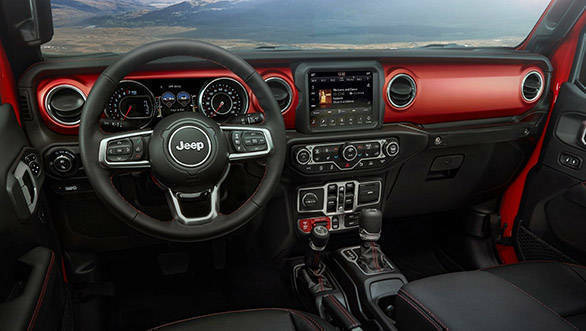 About the cabin of the 2019 Jeep Gladiator, the company mentions that the heritage-inspired center stack features a clean, sculpted form that complements the horizontal dashboard design. A hand-wrapped instrument panel features a soft-touch surface with accent stitching on Gladiator Overland and available on Rubicon models. The pick truck features climate and volume control knobs, media charging and connectivity ports, and Engine Stop Start (ESS) control are all sculpted for quick recognition and are easily within reach of the front-seat occupants. Inboard and outboard circular HVAC vents are surrounded by a platinum chrome bezel for a precise and premium yet rugged appearance with full functionality. It gets a 7.0 or an available 8.4-inch touchscreen that houses the fourth-generation Uconnect system and sits prominently atop the center stack. It also gets a 5.0-inch touchscreen is standard on Gladiator Sport. Directly below the touchscreen are functional features, such as climate and volume control knobs and media connectivity ports. 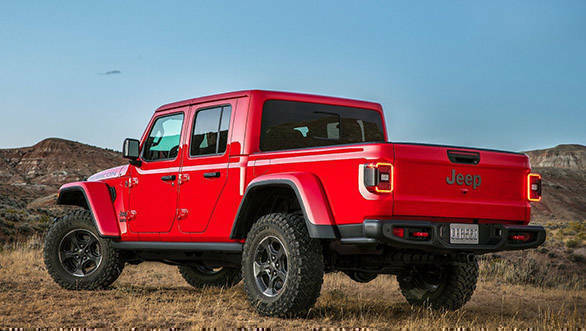 The all-new Jeep Gladiator is offers with a 3.6-liter Pentastar V-6 engine at launch while a 3.0-liter EcoDiesel V-6 engine will be offered later in 2020. The 3.6-liter Pentastar V-6 engine produces 285PS and generates 353Nm of torque and features ESS as standard equipment. It is engineered to provide a broad torque band with a focus on low-end torque, an essential trait needed for extreme off-roading. This engine is mated to a six-speed manual transmission that is standard on all Gladiator models equipped with the 3.6-liter Pentastar V-6, and an eight-speed automatic transmission is optional. 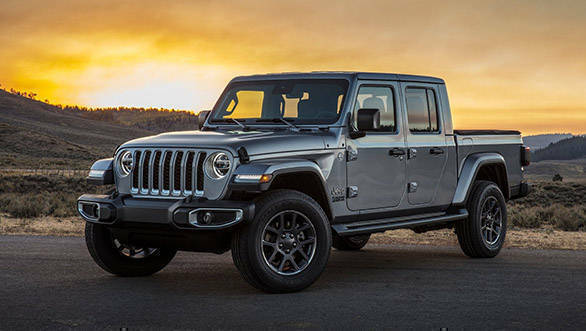 The all-new 2020 Jeep Gladiator is offered with an eight-speed automatic transmission. The pick-up truck will be equipped with the standard six-speed manual transmission.